We’re testing pre-release versions of our iPhone app on customers to get feedback on new features. Keen to become one of our Test Pilots? First, you need to be running iOS 10 on your Apple device. Secondly, you need to register your interest with us and then install Apple’s special TestFlight app. 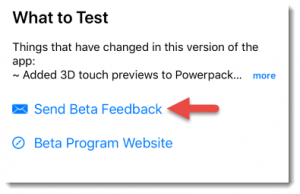 TestFlight will deliver the beta builds straight to your device. Please note that beta builds are just that – a beta version of the Powershop app which is still a work in progress, meaning that while you get to play with all the whizzy new features first, there may be some functionality issues, or pesky bugs lurking around. One of the reasons we’re doing these beta tests is so we can find out about any of these glitches or teething problems before we release our app updates to the world. So it’s all for a good cause! If the bugs get to be too annoying you can bail out at any time and go back to using the normal app. Please note that if you become a beta tester, you’ll bear the risk of using the beta app. However, rest assured that if using the beta app causes any detrimental changes to your account or billing we will fix this up quick smart. Follow the steps below to register your interest, then you’ll get an invite via an email from Apple to use TestFlight (this may take a day or so). 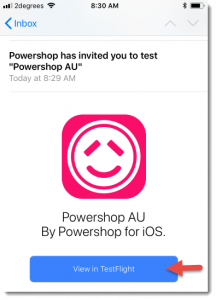 After you’ve got the invite you’ll need to set up TestFlight and then install the first beta build of the Powershop AU app. This will only take a few minutes, then you’re cleared for take-off. Before you start, check you have the Powershop AU app installed on your iPhone. If not, go to the App Store, search for ‘Powershop AU’ and install it. 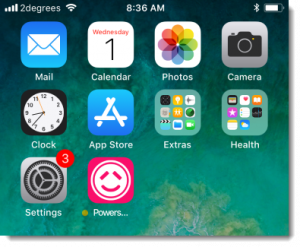 Register your interest to get beta builds by emailing iphonebeta@powershop.com.au from an email address you can access on your iPhone (you’ll need to follow a link from a return email). We will try and approve your request as soon as possible, but it might take a day or so. 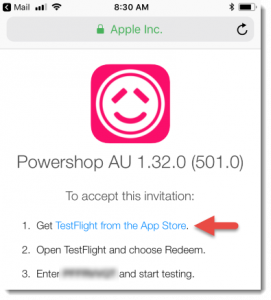 When you’ve been added to our list of testers you’ll get an email from TestFlight (if you haven’t received an email from iTunes Store after a couple days, email us at iphonebeta@powershop.com.au to let us know). Tap the [View in TestFlight] button in the email. A webpage will open in Safari. Tap the blue [TestFlight from the App Store] link to open up the App Store. Once TestFlight is installed, open the TestFlight app. 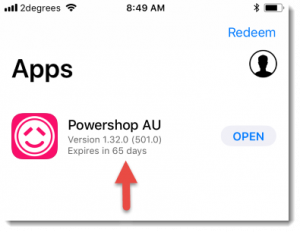 You should see a version of the Powershop AU app waiting to be tested (if not, tap the [Redeem] button on the top right and enter the code from the previous Safari page). Click the [Install] button. If you previously had the Powershop AU app installed you will see a popup warning. Don’t worry, you shouldn’t lose any data or have to log in again. Go ahead and click the [Install]. Once Powershop app is installed, tap the blue [Open] button to launch the app. The app will open as normal, however you’ll now be using a beta build of the app. The beta build of the app will replace your current app, but should not log you out. The beta build app has an orange dot to the left of it. If your Powershop app doesn’t have an orange dot, it’s a not a beta build and you’ll need to repeat the steps above. When a new beta build is available to test, you will get a push notification and an email sent to your iPhone. Open the notification, open the TestFlight app from the home screen, or open the email to read the notes on what new features to look for. Then install the latest beta build from TestfFlight. To send us feedback on a beta build (e.g. if it keeps crashing on a certain screen, or you want to comment on the new features, etc.) 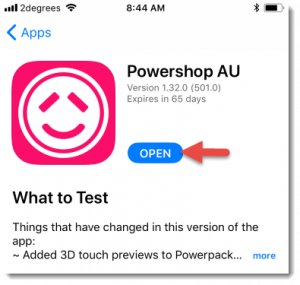 open up the TestFlight app, tap on the Powershop AU app icon, then tap the [Send Feedback] button to open an email where you can enter your feedback. You can attach screenshots in the email if you think they will be useful. Beta builds last for 90 days after they are released. To see how many days are left, open the TestFlight app and look for the small text under the blue Open button. TestFlight is only available to iPhones, iPads, and iPods running iOS 10 and above. If your device is running an iOS version less than 10, you will need to upgrade to use TestFlight. 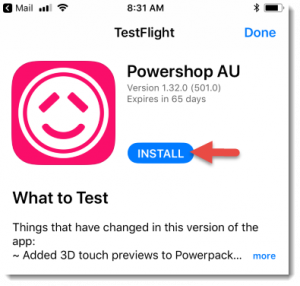 If you no longer want to get beta builds of the Powershop AU app, you can unsubscribe from TestFlight. Open up TestFlight and tap on the Powershop app icon. Scroll to the bottom of the screen and tap the red [Stop testing] button. This will mean you won’t receive any more beta builds of the app. Uninstall the beta build of Powershop AU (the one with the orange dot) and then reinstall the normal app from the App Store again. 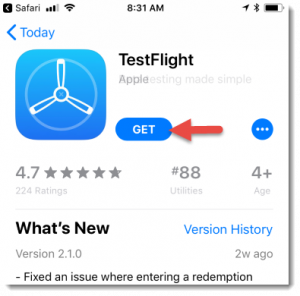 Uninstall the TestFlight app from your device. Have an Android? Get the Test Pilot details here. Read previous: What can we do to go plastic free?